Did you know that nearly 22% of the 800 apps downloaded every second from the app store are never opened more than once? Scary, right? Now imagine the increase in likelihood of abandonment if your app onboarding isn’t a quick, easy-to-follow experience. You’ll encourage users to move away from your app before they even get a chance to see the value that it delivers. Luckily, these 5 tips can help shape your onboarding and make sure your users get past the initial screen. Rather than dropping your users into a seemingly never-ending introduction to your application, tell them where they are in the onboarding process; let them know that it won’t go on forever, and they’re just a few steps away from being able to enjoy their newest download. The last thing a user wants to do after downloading your app is spend too long clicking through a tutorial or onboarding screens. Shorter is sweeter, and the less text-heavy the better. Try using email or social account log ins and sign ups to cut down more onboarding time. Don’t start the experience by requesting access to an endless list of functions within your user’s phone. Start it off slow, and only request permission when it’s necessary. 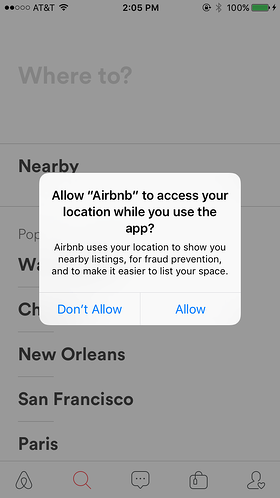 Take the lead from Airbnb who only requests permission to use the user’s location when they begin to search for accommodation “nearby.” The less clutter your user has to click through in the beginning, the happier they’ll be, the longer they’ll stay and the more likely they are to come back. You should be aware and acknowledge that your users don't care about the same things that you care about; they want the experience on their terms. By leveraging common sense and fact-based assumptions, you will ultimately be able to provide a better experience during the user’s first few times in the app. Now, this isn’t “onboarding” per se, but it does impact the user’s initial impression of your solution and will make a dramatic difference in long-term retention and engagement. By making assumptions about how much your users know, how often they’re using their device, and the amount of time they’re willing to spend before bailing on your app, the more intuitive and engaging your solution will be. Need more tips to help drive success for your app after it’s launch? Read our recent whitepaper, “CMO’s Guide: What to Expect When You’re Expecting… A Mobile App,” to learn about app store optimization, post-launch loyalty and user data analytics.